Ambassador for the program to support conservation law enforcement, PALL (le Projet d’Appui à la Loi dans Lomami); Public relations officer Maniema. A turning point for Léon was when he learned that his colleague, Boni, was twice slashed with a machete while struggling to get the shotgun out of the hands of a poacher who had shot at his patrol team in the park. Boni prevailed; the man with the machete fled and Leon tried to get justice. Unfortunately a bushmeat lobby was there first. It was Boni who received the arrest warrant not the poacher with the gun, and the project was asked to close its doors. Leon managed to reverse these two decisions, but never to get justice. Leon understood that there was a long way to go to get conservation laws taken seriously and to make the courts work to implement the law not the wishes of lobbies. Léon was born in 1980, in Kindu, Kailo Territory, Maniema Province. 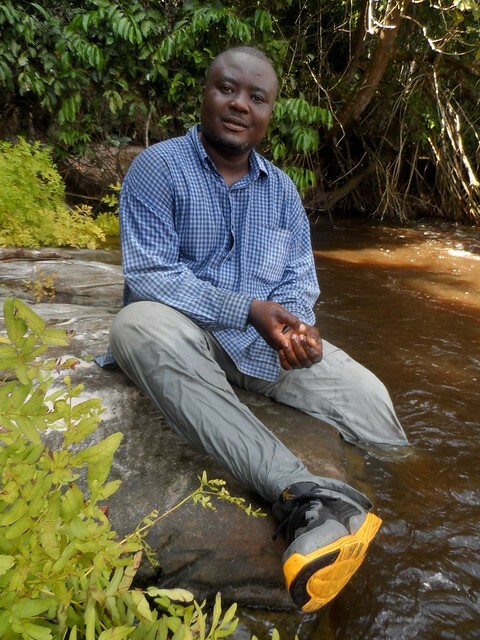 Since 2009, he is the liaison person of the TL2 Project in Kindu. When the project initiated support of law enforcement, he took the lead for the newly created PALL. Leon studied accounting and administration at the University of Kindu. After graduation he worked for the environmental minister and that is where he met Terese. Communication has intrigued him from a very young age, but the importance of conservation he learned with the provincial minister. 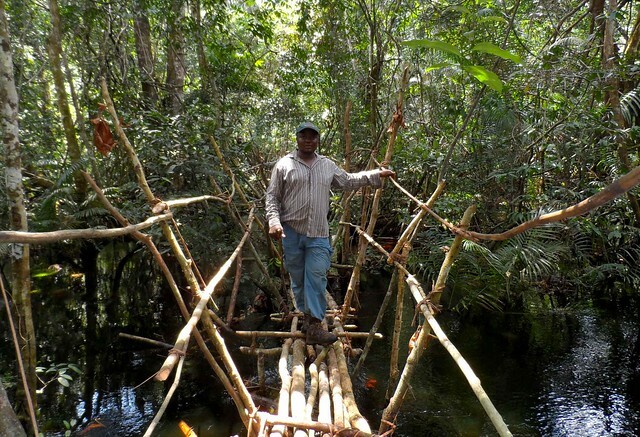 He saw how the TL2 project combined the two: conservation of the Lomami Park depends on support of the local people and all authorities, traditional and government. An advantage for Léon is that he works where he grew up; however, it is still very challenging to communicate the importance of a national park to hunters. Is it possible? Will they accept the park? As the project advanced, Léon saw that good communication, based on respect for local communities, led to strong collaboration. Yes, it is possible. Expansion of communication. With PALL Léon introduced an undercover aspect to his work. In this way he found out about the sale of protected species like Bonobos in markets as well about merchants buying grey parrots for resale during the closed season. Expansion into law enforcement. 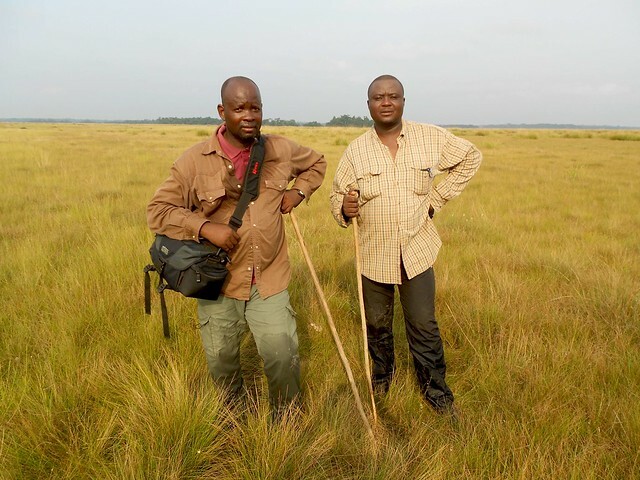 With PALL Léon pushed conservation beyond confiscation and into arrest and punishment. Earlier when a hunter was found with bushmeat in the park or a trader had bushmeat during the closed hunting season, the bushmeat was taken, but there was usually no further punishment. And the infractions continued. Enforcement makes a difference. For instance for the past 6-7 months, and after a series of arrests and prosecutions, there were no more Bonobos sold in the markets. To assure arrest, trial and punishment PALL works closely with local and government authorities. This involves a lot of education …even of the judges. Expansion to fight against corruption. Léon says this is the most difficult aspect of PALL. After receiving money a Police or other authority will say “we should not damage our Congolese brother just because of an animal… we should let him go.” Sometimes Léon, himself, or Robert, his assistant in the northern province of Tshopo, receives offers of money. The offers along with the threats become very large in big cases, as when a general was under trial in early 2016. Need for collaboration. With PALL Léon finds that collaboration between different branches of TL2 becomes even more critical. The patrol teams in the park are an important source of information and the outreach teams are an essential way to spread the message. And, Leon insists, arrest and punishment is not the end; the person arrested must realize that he did wrong and must realize that he can continue his life without breaking the same laws. His favorite part of the work is when a person denounces the very illegal activity for which he was arrested. Léon’s dislikes, worries and hopes. He worries that in the future all his children may not get a good education. Léon has four children and since they live in Kindu he can spend a lot of time with them. His father was the headmaster of a school and continues as an advisor in the education system.